Home / E-books • Grow Hair • Hair • Hair Care • Hair Growth • Healthy Hair • Long Hair / Get Your Copy of Grow Hair Healthy & Long with Natural Oils E-book! Update: This book was updated and relaunched in June 2017. Read about the updates and how to get your copy for up to 20% off at How to Grow Hair Healthy and Long with Natural Oils Relaunched. I’ve been compiling this guide for quite some time. I began my journey with oils in 2012/2013 after a nasty experience with braids left me with several bald and thinning areas on my scalp in 2012. Up till then, I had tried so many different things without results. I grew back my bald spots, the thinning areas filled in, and my curls started coming back to life. I continued researching oils and incorporated as much as I could into my own regimen. I know so many other women struggle with the same problems and wanted to share what worked for me, hence Natural Oils for Hair and Health was born. 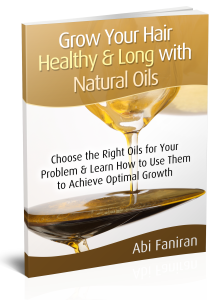 The Grow Your Hair Healthy & Long with Natural Oils e-book addresses the most common problems and which oils you can use to alleviate them on your way to achieving optimal length and health. Here’s what you’ll be getting with this e-book? The best-curated content from the website along with additional research. My subscribers receive a special 20% discount. Get on the list HERE. If your hair wishes include Growth, Retention, Moisture and Everlasting Curls, then you definitely want to get this e-book! Mabrouk. just got a copy and can’t wait to get into it :). Thanks. Let me know if you have any questions! This book was very informative and I really loved the chapter on scalp issues. Very useful. Thanks. Thanks for the review Tope. My next book is now available for pre-order in case you’re interested. Check out The Ultimate Hair Growth Guide here – https://www.naturaloilsforhair.net/the-ultimate-hair-growth-guide.